Today, I started up the latest internal build of the game and was immediately struck by something new. I’ve been talking a lot about the work we’ve been doing on our UI, but up until this point, our in-game experience has involved a very bare bones, development-style UI mainly intended for us to keep track of numbers. Today though, I discovered real UI! With visual design and animations that respond to what I’m actually doing in-game! It was like watching doors that had been holding us back open, letting us get closer to our goal of a finished demo that we can be proud of. As thanks, I would like to finally introduce you all to Elis “Ekah” Ekdahl, the 2D Artist that has spearheaded this endeavor and made this new accomplishment possible. As a form of insufficient celebration, I thought it would be fun if we took this opportunity to conduct a short interview with him! It’ll make this post a little longer than our usual posts, but I think it’s worth it. Eric: Hey Elis! To kick this off, why don’t you tell us a little about yourself? Elis: Hey Eric! I’m very excited to be a part of the GoE team. I’m joining you from Scandinavia, Sweden to be more exact as a 2D artist/graphic designer for the game. I’ve been involved in the project for a few weeks and my primary focus lately has been the user interface design of functions such as the inventory, radar, and so on. Eric: I have friends who work in the art field and they tell me that it can be a huge time investment; what’s the process like for you? Elis: Well, after I come up with the original concept for something, it usually takes about 50-60 revisits where I change some detail and Sledge and I talk about it and so on until we get it to the standard that we want. We want to strive towards a simple and sleek UI design which is something that I think most players want. Something that’s not confusing, but it’s important I think not to get too plain or boring. Eric: Oh man, that’s a lot to get it “just right” but I get it! What makes all that worth it for you? 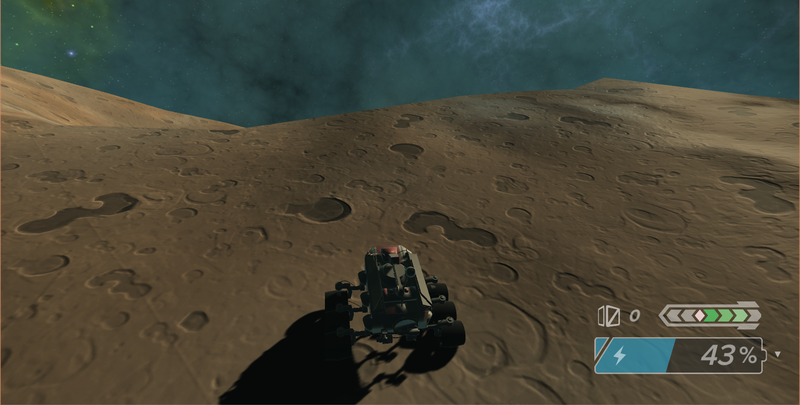 Elis: I’ve always been a bit of a astronomy geek, so just getting to ride a rover on a asteroid texture that I’ve designed feels great and is exciting enough! I’m looking forward to bringing all my knowledge of working in Photoshop for about 10 years into the game though, so I think the things I’ll find most fun will be the small detail stuff that will come into some objects later in the game. Eric: I feel the same way with writing for this project. Well this has been a lot of fun, so how about we close this out with a personal question: what sort of games are you into? Elis: I grew up playing a lot of Super Nintendo, Yoshi’s Island really impressed me graphic wise as a kid! Other games I love are the Portal series, the Stanley Parable, I’ve spent probably a few thousand hours just playing Team Fortress 2 (heavy, spy and scout are my favorite!) and Overwatch, so those games are huge inspiration graphic-wise to the kind of game I want to make and play. But I want to make something more realistic than those too, while still as cheerful and happy. My favorite platformer of all time is Jonathan Blow’s Braid. Amazing puzzles, interesting mechanics, a good story and David Hellman made some stunning artwork for it. A big thank you to Elis for taking time out from being far more talented than I am to do this interview, and a big thank you to you for reading it! If you missed it, don’t forget to check out our Monday poll results (and head over to Twitter to vote on our current poll). We’ll be back next week with another update on our development process, so stay tuned! Until then, you can follow us on Twitter and Facebook for the latest updates on all things Gears of Eden, and if you’re so inclined, you can even sign up for our newsletter! Don’t worry, we hate spam too, and it puts you in the running for a free key to the alpha! Finally, if you’re feeling particularly generous today, you can back the project in exchange for some fun rewards. Thank you so much, and have a great day!